Dr. Yang, could you please summarize for our readers how the first year went? With the exception of a few events, the first year of the 10 year program went very smoothly. In this year, I have learned how to treat today’s younger generation. Dr. Yang, could you please summarize for our readers how the first year went? What do you think of the experience so far? Did things proceed according to plan? What were the main highlights and challenges you faced during this first year? With the exception of a few events, the first year of the 10 year program went by very smoothly. In this year, I have experienced and learned how to treat today’s younger generation. Growing up today is very different from when I was young and I now have to constantly adjust myself to fit in with their backgrounds. However, I also have to find a balance to ensure that they keep good discipline. At the same time, all the disciples must also adjust themselves to find a way to fit into the new training environment which they have never experienced. In this year, these things have gone better than I originally expected. We have accomplished about 70% of the capability and training contents which were originally planned. The arm conditioning is still behind schedule and will be continued in the next year, but everything else has gone by smoothly. I am hoping that in the next few years all the disciples will be able to establish the most important point in all the training, “self-discipline.” I realize that there are different ways of teaching and different ways of learning and I plan to adjust my ways until our goals are reached. Throughout the year, we have had a few challenges to face. The first has been getting a student visa for foreigners. Since YMAA CA Retreat Center is not recognized as an educational organization, we still can’t issue I-20 forms for students. This has made the training for foreign disciples very difficult. The second challenge has been keeping everybody in high spirits. This has been very difficult because once the “honeymoon period” is over, everyday routines become more tedious and less exciting. The third challenge has been avoiding possible injuries while pushing the disciples as far as possible. Finally, the fourth challenge has been our financial issues. Due to the lack of funds, I have to constantly worry about the future of the program. We are however, very fortunate to have a couple of sponsors to help us out. It isn’t enough to cover all expenses, but I am extremely grateful for their support. 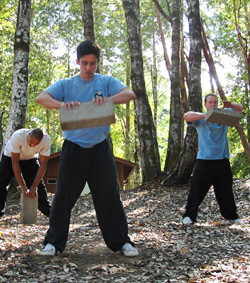 -What does the next phase of training consist of? What will this second year look like? After the first year’s body conditioning, the second year will consist of more technique training. This will include kicking, punching, wrestling, and chin na. The White Crane style emphasizes more short-range fighting while Long Fist specializes in long-range fighting. Both will be instructed, meaning the introduction of a lot of combat skills. In addition to this, basic conditioning for weapons such as staff, saber, and sword will also begin this year. This will build a firm foundation for future weapon training in the following years. -I remember seeing a video with 5 students earlier in the year, but the last video only featured 4. What happened? Due to the hard training, Mike decided to leave after 7 months. He discovered that this lifestyle of conditioning and training was not for him and he returned to his old life. -For several months, you have been living 24/7 with your disciples. How has this experience been on a personal level? Actually, it is like I have adopted 4 sons. We live together like a family and I am not just their teacher but also their father. The relationship is hard to describe. -In one of the last updates you e-mailed, you wrote, “New applicants are now in California for their testing phase in CA and up to five more students will be accepted for the semester starting September 1, 2009. After this final testing period, the final decision will be announced at the end of May 2009. These are the final students that will be accepted into this training program, which is scheduled to be completed in 2018.” How did things proceed? Did you accept any new students? Will you? After interviewing through email and phone, five out of a group of 12 applicants were chosen to come to the Center for testing. From here, only three were selected. There will be one from Florida, one from California, and the last from Switzerland. These new disciples will be introduced to the public at the beginning of September. After many days meditating on the nothingness, training the body and mind, many treasures were attained. During the first year of training, Master Yang guided us to experience a training method based in traditional concepts which resulted on the development of basic skills that support deeper levels of training. I feel much stronger physically and mentally, able to overcome any challenge. Skills like Root, Jing and Jumping were well developed, opening the way to deeper Traditional Chinese Martial Arts. I loved it and wouldn't trade it for anything. The first year at the Retreat Center has been filled with many different experiences. I have learned much, including not only Chinese Martial Arts, but also Qigong, cooking, video production, writing, and Chinese language & culture as well. Throughout the year, in learning and living at the Center, I have also had many ups and downs both mentally and physically. However, I believe all of these experiences will provide me with a much more stable foundation which will enable me to attain higher levels of understanding for the future. The first year is over. It has been tough, and the training has been hard, on out bodies as well as on our minds, but we managed to pull through it. This year was my first training under Dr. Yang, and I must say that it has been a real honor to do so. He is a great teacher, and all the knowledge that he possesses inspires you to learn and train hard. I feel very fortunate to be in this position, and I am excited to begin the second year. This first year was mostly focused on body conditioning. I believe that this second year will be easier than the first, because we are already becoming accustomed to this way of life, and also it will be more fun because we will be concentrating on perfecting techniques and developing skills, that will allow us to continue learning and improving during the 9 remaining years here at the YMAA Retreat Center. Training at the Retreat Center under Dr. Yang has been a very positive and rewarding experience. There have been many difficulties and challenges, yet we remained dedicated, trained hard and throughout the year have made considerable progress. We spent this first year building a solid foundation, training our bodies for strength, speed and power and developing our minds through meditation. Overall It has been a great year. I’ve learned much about myself and the traditional arts and I look forward to training hard next year.